Are the new 405 toll lanes helping or hurting? I know there are a lot of conversations happening around this. The intent, to keep carpool lanes moving at 45+ MPH, appears to be working. I am torn. I see bigger challenges that need to be solved, but when I was driving 405 and carpooling, it really didn’t save much time. So.. I am curious what you all think? 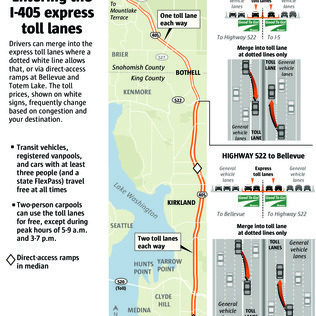 BELLEVUE – More drivers are using the new Interstate 405 express toll lanes, according to data collected from last week’s commute. For the first time in years, Interstate 405 drivers had a choice today for a reliable weekday commute using express toll lanes. For $1.50 in the morning and a 75 cent toll in the afternoon, drivers saved about 30 minutes on their commute between Bellevue and Lynnwood.